For a long time, I’ve wanted to do work that captures everyday people, but somehow shows the intense, heart-breaking beauty I see in them. But when I encounter people in a day-to-day setting, they are not posing – they are moving and as difficult to pin down as a school of fish. 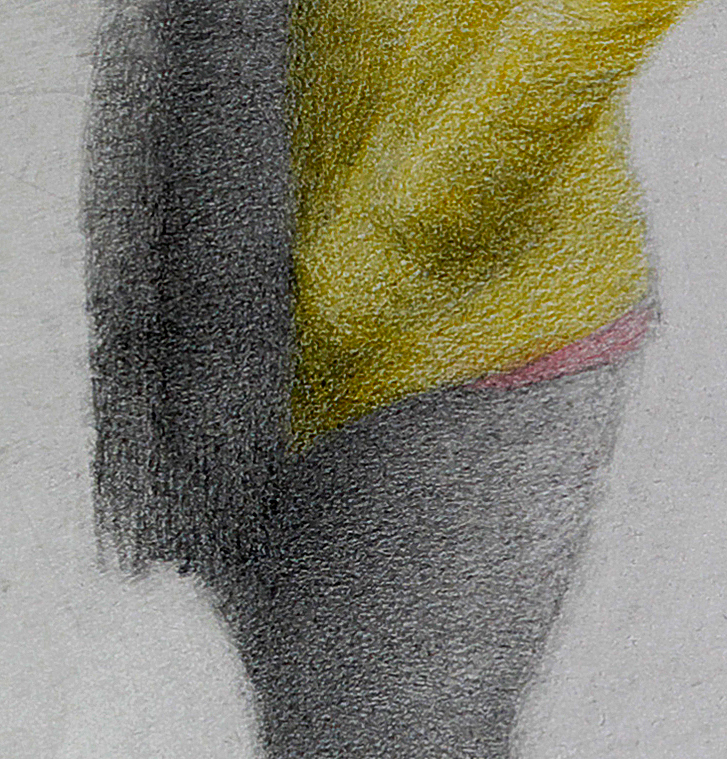 For a while I tried sketching, but there is simply too much information to record this way. So, reluctantly, I turned to photography as an aid. This is the first complete piece I have done that uses photo references. I took pictures at bus stops, sometimes on the ground and sometimes from the window of a bus. Before, I have always drawn from imagination or from direct observation, so it took me a long time to figure out how to work with photos. Printouts didn’t work – I found them flat and drained of the beauty I was trying to capture. But I noticed that looking at the photos on a computer monitor preserved their life, maybe because a monitor image is composed of light itself. Now I just keep the photo open in Photoshop as I draw. I also made sure that I didn’t simply copy the photos. It’s far more interesting to interpret, and to use the photos as a starting point, but then reinvent the people so they are truly my own. Now, I know how to do that successfully. This piece is 22.5″ tall and 19.5″ wide. 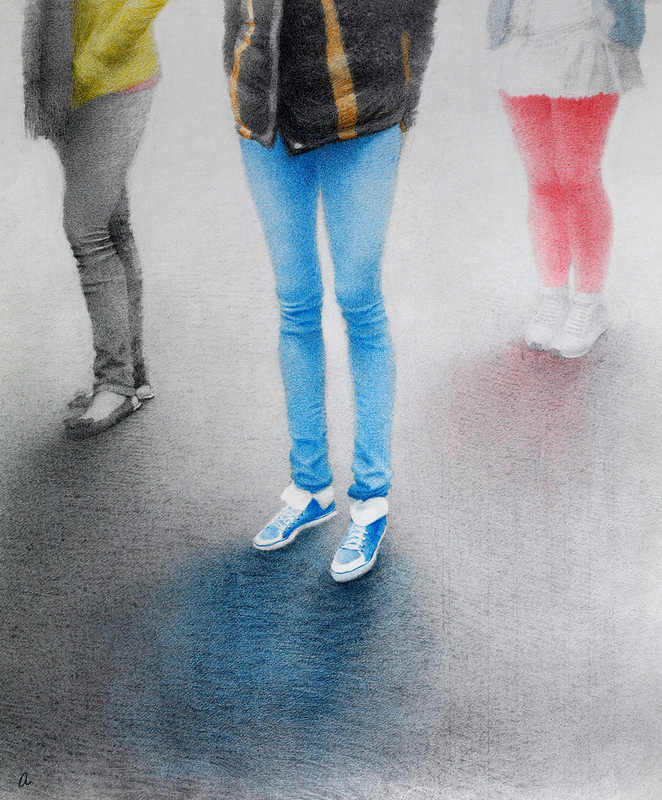 It’s graphite and colour pencil on paper. 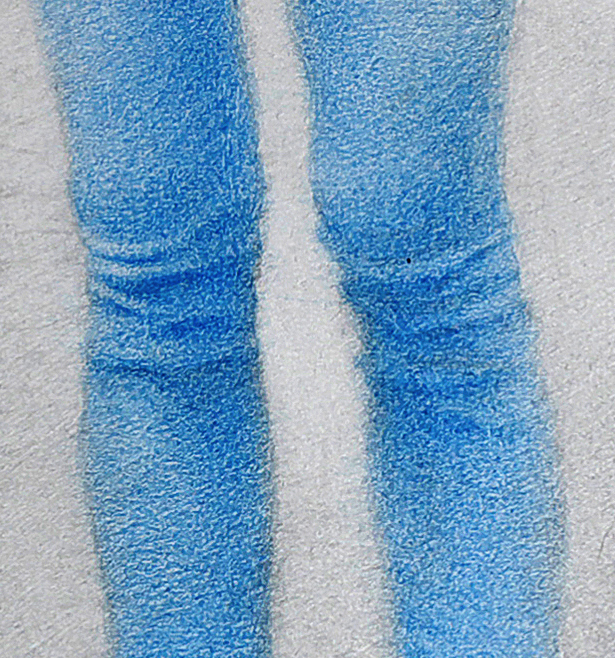 It took about 60 hours to do, and I spent half of that time working out the structural geometry of the feet belonging to the Pink Tights woman. 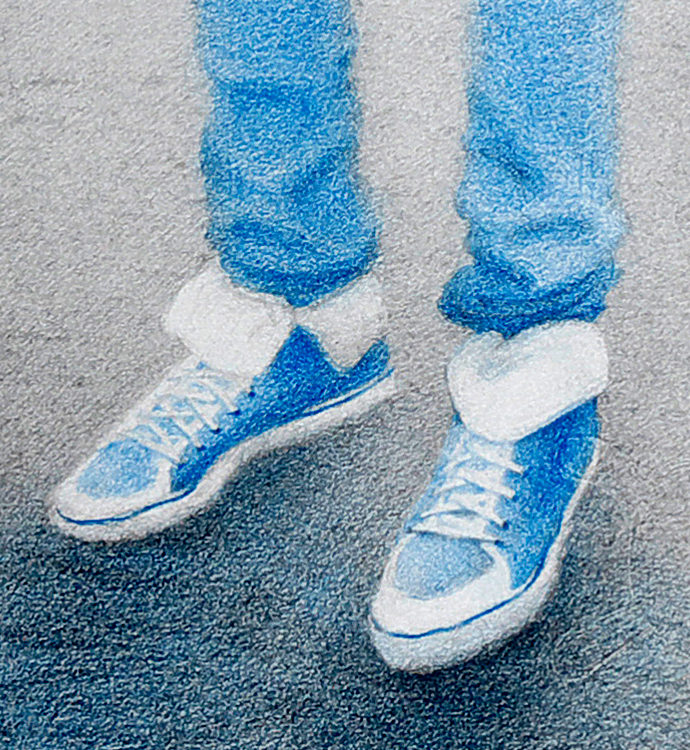 Bulky sneakers hide and distort so much that it’s very easy to end up drawing two left feet.